Hope any French Members and their families are safe. There just are no words any longer for the kind of violence and terror we're seeing. This is France's September 11th. A couple hours before this happened I was having lunch with a classmate and said the world couldn't go on the way it's been going. I had no idea anything like this would happen a couple hours later. It is heartbreaking. What a terrible tragedy. All I can think of today is how terrorizing yesterday was, and what fear the french people must have today, knowing that you are no longer safe anywhere. My thoughts and prayers go out to the family of the American college student that was killed in this cowardly act, also with the french people, and those that have been injured or killed. I hope France feels our love, concern and condolences from all over the world as they try to make sense of all of this. Last night was the first time when I had second thoughts about leaving my house and attending an event. I was driving down familiar roads and found myself thinking, "what if some terrorist decided to shoot-out/bomb right here, right now?" I'm not afraid of dying, I just wouldn't want to die being blown apart by a bomb. The degree of violence in the world, political and crazy armed people, has reached proportions that are hard to believe. Terrorists' goals are to terrorize people. I don't want them to "win", but I have to admit I am scared. I guess I don't feel very personally threatened but I think of my daughter, who lives in NYC and likes to travel out of the country if she can. I still worry for all those good and decent people around the world, for the craziness that breeds unceasing. We live in an unsafe world, were some people think this type of brutal behavior is okay and justified. I wouldn't be able to live with myself if I hurt or killed anyone for a religion I believe in, or some issue I didn't agree with; it is hard for me to understand why someone would do that. It’s something I kinda worry about in DC. One of my FB friends owns and club and pointed out that Washington is a world city like Paris. The victims there were doing what Parisians love to do on a Friday night—go to a soccer game, a restaurant, a concert, etc. Our neighbourhood is restaurant central but I doubt we’d be targeted. Someone wanted to know what French security is like—how there wasn’t more of it at a stadium where their president was there for a game. "The purpose of terror is terror. While the damage inflicted by a terror attack is huge for those directly caught up in it, the main intent is to change behavior of the targeted population by instilling fear in them all out of proportion to the damage. It’s not the idea that a hundred people or more getting killed at once isn’t terrifying — it’s the idea that it could happen anywhere, anytime to YOU! It’s the intent of attacks like this to make the authorities respond to that fear with measures that institutionalize that fear and impose a burden on everyone." There's a reference to a sci fi book that is quite interesting. The attack on Paris isn't the only act of terrorism from this week. My Facebook feed was giving me hope--thoughtful, compassionate comments mindful of problems elsewhere in the world--and then I realized that I've fashioned a little echo chamber for myself there. I can't face the horrors happening in response to these horrors. That's exactly the purpose of terror, Lynx! It just dawned on me that while at work on Sat. at the library I saw no women/girls with headscarves. That's unusual & it was a pretty busy day. Unfortunately, I'm thinking fear might be the reason. 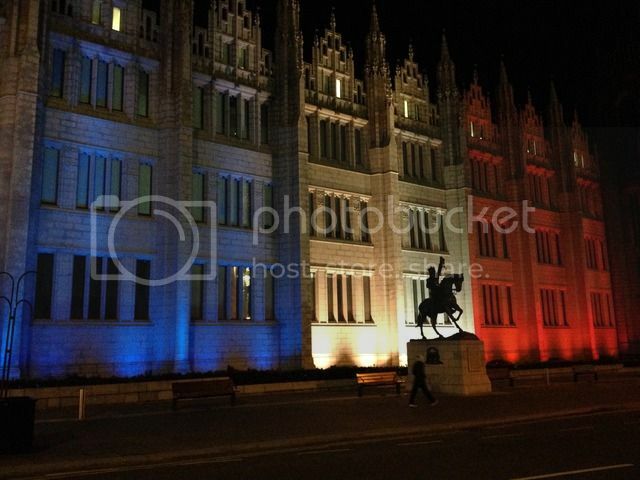 Earlier tonight while passing Marischal College, Aberdeen - lit up in tribute to the Paris victims. Vive la France! Iraq apparently warned that IS were planning attacks. Russia, France, UK and USA were top of the list due to Syria involvement and a despising of our culture of enjoyment. The Russian plane, now Paris. No fear! The other aim of attacks like these is to push ordinary people into fear, thus putting more pressure on moderate Muslims and the refugees who are fleeing these jerks. They hope to use that pressure to radicalize even more moderates, or young people raised by moderates. It is insidious all around.